Green Classroom Theme & Decor! 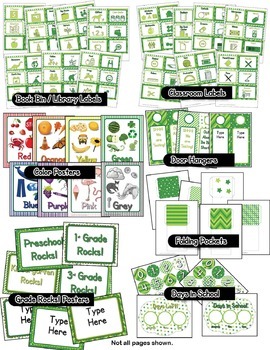 This megapack / bundle contains 709 pages of printables for you to use, decorate and organize your classroom! Looking for some options for your classroom, so you can pick and choose what you want? Even if you don’t have a themed classroom there are some great materials for you to use in your classroom. 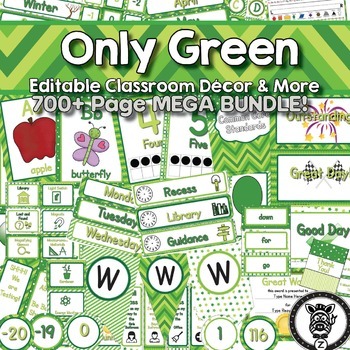 This green theme will add some style to your classroom and help it stand out from the rest. These are ready for you to print out, laminate and use! This pack also contains LOTS of editables for you to customize! Alphabet Character Squares - Editable! Binder Covers / Spine Labels - Editable! Book Bin / Library Labels - Editable! Circle Numbers (-20 to 120) - Editable! Dolch words / Flash cards - Editable! Grade Rocks! Posters - Editable! “Hello my name is” Badges - Editable! Number Squares / Calendar Days (-20 to 200) - Editable! Reward Punch Cards - Editable! Digital Clock Labels - Editable! Finger Sign Posters - Editable! Need help editing the PDF? Click here for a free guide / tutorial to help you with the editing process. Provided is a sample editable PDF to test out editing a pdf. **Please contact me if you are having issues BEFORE you rate my product. If something doesn't seem right, let me attempt to correct it for you before you leave your feedback. Each square has a capital letter on it. These squares would make a great header for a word wall or as flashcards. 9 cards per page, squares measure 3.5” x 3.5.”. Want options for your bunting/pennants to hang in your classroom? Here are 18 different ones to choose from, as a editable pdf. 3 different shapes to choose from and each shape has 6 different color schemes! Print out on 8.5”x11” pages. 39 Binder Covers / Spine Labels - Editable! 39 different binder covers that you can print out. 6 pages of printable spine labels for each of the 39 different binder covers. Sized to fit a standard 3 ring binders. Spine labels measure 1”x10” and print 7 to a page. Both the binder and the spine labels have an editable page for you to fill in. 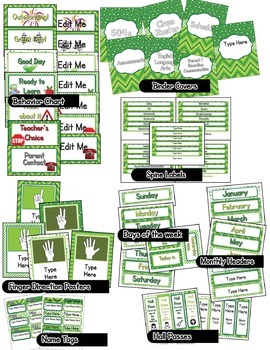 108x Book Bin / Library Labels - Editable! These labels would be great to help you maintain a well organized library. Help your students know where to look for books or where to return them when they are done reading them. This set contains 108 different library / book labels. Labels measure 3”x4” and print 6 per page. There is a blank page with editable fields for you to type in your own labels if needed. 5 Senses, ABC books, Adventure Books, Alphabet Books, Animal Characters, Apples, Around The World, Art Books, Award Winning, Back to School, Big Books, Biographies, Birds, Board Books, Chapter Books, Christmas, Classic Books, Clifford, Color books, Counting, Cultures, Dental Health, Detective, Dinosaurs, Earth, Earth Day, Earth Science, Easter, Explorers, Fables, Fall, Family, Fantasy Books, Farm, Fiction, Food, Friends, Frogs, Funny Books, Geography, Graphic Novels, Halloween, Hanukkah, Harry Potter, Health, Historical Fiction, History, Holidays, How To, Humorous , Informational, Insects, Inventions & Technology, Legends & Myths, Life Cycles, Machines & Building, Magazines, Magic School Bus, Magic Tree House, Magnetism & Electricity, Math Books, Monster Books, Multicultural Books, Music Books, Mystery, Native Americans, Nature, New Books, Occupations, Ocean Life, Pets, Plants, Poetry, Polar Life, Presidents, Pumpkins, Rainforest Life, Realistic Fiction, Relationships, Reptiles, Rocks & Minerals, Safety, School, Science, Science Fiction, Sea Life, Seasons & Change, Seek & Find, Shape books, Silly Stories, Solar System, Song Books, Songs & Poems, Space, Spiders, Sports, Student Authors, Superhero Books, Teacher Favorites, The Human Body, Transportation, United States History, Veteran’s Day, Weather, Wild Animals, Winter, World History, Zoo Animals. 156 different classroom labels! Each label has the name of the object on it as well as an icon that represents what the name is. Labels measure 3”x4” and print 6 per page. Each poster contains 4-6 images that show the color. The colors included are red, orange, yellow, green, blue, purple, pink, grey/gray, brown, black and white. Each posters is on an 8.5”x11” page. A simple poster for you and your class to keep track of the number of days you have been in school. The poster is marked with ones, tens and hundreds and has two sets of number circles for you to cut out and place on the poster to show the days in school. 316x Dolch words / Flash cards - Editable! This contains all 220 Dolch sight word flashcards and 96 Dolch Nouns. 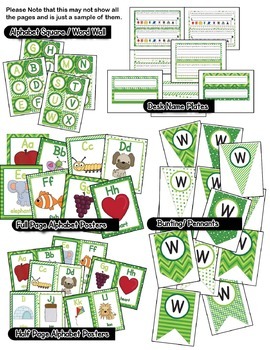 Use these high frequency word (HFW) cards to help your students practice their sight word fluency. The cards are from the six different categories associated with the Dolch Word Lists: Pre-Primer, Primer, First, Second, Third and Nouns. Print out these cards on card-stock, laminate, and have them last forever. Each card is 2.5”x5” and print 6 cards per page. Editable page so you can add your own words to the list! 2x Door Hangers - Editable! Let people know that you are taking a test or that you will be back shortly with these easy to print door hangers. The door hangers say “SHHHH We Are Testing!” and “Out & About Be Back Shortly.” Print out, laminate and then hang outside your door. Each door hanger measures 10”x4” and come in two colors. Editable so you can write whatever you need on them! These folding pouches are an easy way for you to store cards or use with library books. Simply print them out, fold them and then tape/glue them. I have made them so they don't print color on the folding tabs to save some ink. Full 11”x8.5” posters that you can welcome students to your class with, includes Pre-k, Preschool, Kindergarten, 1st Grade, 2nd Grade, 3rd Grade, 4th Grade & 5th Grade. Contains 6 editable pages with large text boxes so you can make your own signs. These are cute multi-colored badges or labels you can print out and give to a class visitor or for students so people will know their name. There are 6 different styles. Each badge measures 2.6”x4” The editable document has two fields so you can write something other than Hello my name is, and you can type in the student’s names if you want. This set contains 59 Different classroom jobs for your students. Each label contains one of the following job titles and an icon to represent the job title. Each square is 3”x3” and there are 6 squares per page. This is every single letter in both uppercase and lowercase, with numbers 0-9 and lots of punctuation! Print these out and use them on bulletin boards, write fun messages on your door, or around your classroom. All 12 monthly headers (January, February, March, April, May, June, July, August, September, October, November, December) with a cute chevron background. 2.5”x10” Contains 6x colorful editable blanks for you to add your own text. 3 different styles of desk name plates. The first set has two color options and includes the alphabet , shapes (circle, square, rectangle, oval, parallelogram, rhombus, hexagon, trapezoid, triangle and star), colors, left & right and a 0-20 number line. The second set has the alphabet and the 0-20 number line. The third set only has the writing area for student to write their name in but comes in 6 different colors. Large 4” circles that would make a great number line, comes in 6 different colors. Also has a blank page so you can add your own text / numbers. These squares would be great to use for calendar days, in math to practice basic facts, for student numbers, in math centers or as labels. There is 3 different sets of number squares for you to mix and match. Squares print out 12 to a sheet and measure 2”x2”. Also has a blank page so you can add your own text / numbers. Same as the half page number posters but on 8.5”x11” pages. Looking for some cute looking coupons you can quickly print out and use for rewards in your classroom? This set contains 60 different reward coupons. Prints 10 coupons per page with 6 pages of coupons. Each coupon measures 2” x 3.8”. Page of blank reward coupons so you can add your own! 60 different schedule cards in 3 different styles! The first layout has a graphical icon and the name for the activity. The second layout has a graphical icon for the activity, the name of the activity and a clock. The third layout has the same as the second layout with room to write the analog time under the name of the activity. 180 different schedule cards! Each of the layouts has a blank (without the icons) for you to add your own. Each of these labels contains the name of the season and a tree that graphically shows how the season is affecting the tree. Includes spring, summer, autumn, fall, and winter. Measure 2.5”x10” each. These circles have a solid color in the center and a different color scalloped edge around them. Each has “Table #” from 1 to 12. There are 6 different circle color/border sets repeated twice. Each circle measures 4” and prints 4 per page. Contains 6 blanks for you to add your own content to. These circles are to print out and hang around the outside of your clock, to help students learn time. Time starts at :00 and goes all the way to :55 in 5 minute increments. There are 6 different circles for the 12 times (total of 12 circles). Each circle measures 3.6”3.6” Contains 6 blanks for you to add your own content to. 3x styles of framed writing paper for you to print out and give to your students. There is a lined paper, a lined with a dotted center line and a blank page with just the frame. Each style of paper has 6x colored borders for a total of 18 pages! Looking for a quick way to thank parents, students or administration? Here are 6x cute thank you cards for you to print out. I've included 3 different certificates using the chevron border for you to use. The first one says Excellent Work and has a large red ribbon on it. The second says Great Work and has a gold seal on the bottom. The final one says Superstar with stars on the side. I have also made a set of these certificates editable so if you want to change the title, who it is presented to, and what it is for, you can do that on the pdf! Make an unlimited number of different certificates! Here are the 8 parts of speech with their definition. They match the chevron pattern and will look great in any classroom. Full page posters, one for each month, decorated for you to hang up for your student's birthdays. Addition, Subtraction, Multiplication & Division. Each one has various different words that are associated with each type of problem. Two sets of shape posters, one is full page the other one is half paged (prints 2 per page). There are 5 posters, each has a hand holding up one, two, three, four or five fingers. These are blank / editable because each school does something different. Type in whatever you need for your own classroom. Make sure to check out these other great theme packs!